Chicken noodle. French onion. Potato leek. Beet Cabbage Borscht. A bowl of warm soup hits the spot and offers comforting nourishment. And nourishment is so much more than food. I decided an alphabet would be a fun way to explore and deepen my understanding of this word. I offer it to you in case you feel undernourished – and because I’m curious about the ways you nourish yourself. Legs tucked under me, I settle into the armchair’s embrace and disappear into the pages of an engrossing book. Roasted, steamed, pickled. In a salad, in soup or by themselves. My hands and cutting board turn purple as I peel, slice, grate and chop. 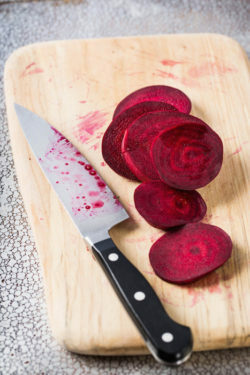 From the color to their sweet flavor, I love beets. The soft glow of the flame adds warmth and invites connection. They wait (im)patiently while I dress for the weather — windbreaker, rain poncho or snowpants and thick jacket. I clip on their leashes and we head out the door. They run, sniff, wallow in puddles, eat blackberries off the vine, chase squirrels and fetch sticks. I throw tennis balls and snowballs, hold one-sided conversations and laugh. We all return home replenished. Every March I look forward to the Spring bulb show at the Smith College. I walk from a monochromatic New England winter into a greenhouse filled with colors and fragrances. I close my eyes and inhale. I marvel at the variety of freesias, tulips, crocuses, hyacinths, daffodils, narcissus and primroses. Sometimes a favorite song comes on the radio and I crank up the volume and sing along. Not worried if I am off key or if I get all the words right. Not worried what other drivers (or passengers) think. Just filling my lungs, lifting my voice. My occasional massages start with a soak in the outdoor hot tub. As soon I step into the hot water, I feel my muscles start to relax. After several minutes of moving around to the different jets of water, I turn them off and sit in silence, looking up at the sky and trees, listening to the wind and birds. The kitchen is my favorite room in the house. The sensory, creative act of cooking feeds my spirit as much as the food nourishes my body, especially when I share the meal I’ve prepared with others. Choose a beautiful card for a friend. Take pen to paper. Share news. Ask questions. Express gratitude and good wishes. Address the envelope and slip the card in. Add a postage stamp. Place it in the mailbox and put the flag up. I don’t understand most of the words of this 16th century Mass by Orlandus Lassus, and that’s what I like about it. Instead my soul responds to the harmonies of the double-choir music. I step out before going to bed and look at the night sky, unobscured by street lights. I marvel at the light of the waxing moon, especially when it reflects on snow, and delight in a sky full of twinkling stars. My head tilted skyward, I ponder my small place in the universe. I rarely feel ready to leave the ocean, whether it’s bathed in sunshine or wrapped in rain and fog. The repetitive sounds of the waves, the salt air and sand between my toes ask me to linger and watch sanderlings scurry at the water’s edge or pelicans fly in formation so close to the water’s surface. I start with the border of the jigsaw puzzle. Once it’s pieced together, I work on whatever catches my attention. The sky – all those shades of blue – is usually last. Absorbed in looking for “one more” piece, I ignore my aching neck and lose track of time. I don’t feel coordinated as I move my arms and legs during the evening qigong class. I don’t have a keen awareness of my energy. I continue to show up because I yawn repeatedly as my body releases tension and I recognize this as a good sign. The pleasure of going to bed when I feel tired. Of falling asleep without tossing and turning. Of sleeping until I wake up rather than being jolted awake by an alarm. The first hot cup of tea in the morning. Black. No sugar. 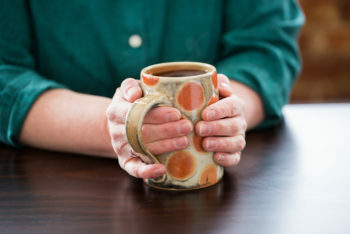 I wait for it to cool just enough, then hold the warm handmade mug and sip as I prepare for the new day. Each week I try to have one day without any commitments. No shoulds. No have-to’s. Just want-to’s. A chance to tune into the flow of my energy and follow where it leads. When it comes to vacuuming, I procrastinate for days. I include it in this alphabet because once I’ve sucked up all the dog hairs, dirt and cobwebs, I feel more relaxed. My home is clean and the nagging voice is quiet. This I know: Immersed in the rhythms of the loom, absorbed in the delight of watching the cloth grow, I feel at home in myself. This I wonder as I learn the movements of qigong: Does the treadling action of my feet contribute to the groundedness I experience at the loom? Does throwing the shuttle back and forth massage my heart? 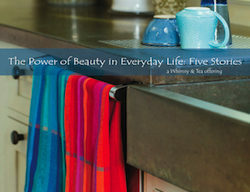 This I know: Whether or not there are energetic explanations for my experience, I delight in weaving beauty into everyday life and find it deeply nourishing. I haven’t used every letter of the alphabet. What suggestions do you have for E, I, J and R – and any other letter? i’ve been rushing around on a Sunday, when I pause to sit, check my email, and then read your blog post. We share many of the same comforts, especially the ocean, cooking, beets, sleep, and unstructured time. I am about to head into the kitchen with lots of tasks to prepare for the week. Your note reminds me to enjoy and savor the time rather than rush through it as I was about to do. You remind me also to think differently about my dog walks, and maybe that it’s not too late to start a puzzle as I do most winters but did not this year. thanks as always, for bringing a little beauty. I hope you savored your time in the kitchen, Lisa, as you prepared for the week. I’m delighted to have brought you some beauty. This was awesome. It made me want to curl up and have some “me” time. Thank you. Lovely imagery to read right before going to sleep after a not so great day. Thank you for writing this and reminding me of all the beauty in our lives. You are most welcome, Laurie. May today be a better day for you with moments of ordinary beauty and nourishment.